I admit it - I used to be a Blockhead. In 5th grade, my best friend Johanna and I would spend all day skulking around Jamaica Plain just to get a glimpse of Joey McIntyre, her favorite New Kids on the Block member. My favorite was Jon Knight, but Dorchester seemed scarier hang out in, so we never stalked him. 25 years later, I’m enjoying lunch at Walhburgers. Paul Wahlberg, brother of Donnie and Marky Mark, is the chef-owner of Alma Nove, an upscale Mediterranean restaurant in the Hingham shipyard. He opened Wahlburgers, a casual burger joint, in the same complex soon after. I believe that they are producing a reality show about the restaurant. It was a beautiful day, so Jes, myself and her daughter Mira sat outside to enjoy our lunch. It was only appropriate that I got “Donnie’s choice” – a BBQ Bacon Burger ($8) with cheddar, bacon, avocado and BBQ sauce. Jes got the “Our Burger” ($6.45), a 1/3 lb patty topped with signature wahl sauce, dill pickles, government cheese, lettuce, tomato and onion. We also ordered tator tots and onion rings ($3 each). Mira’s Smahlburger ($5) was 3 ozs and came with fries. 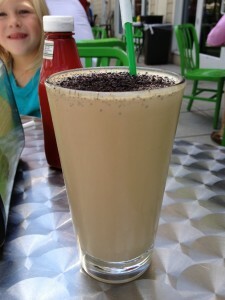 We both got adult frappes ($12): I indulged in the Mud Pie (vanilla ice cream, Kahula, Creme da Coco, Stoli Vanilla Vodka and crumbled Oreo cookie) and she got a pina colada frappe. They were super thick and strong, perfect for a summer day. My burger was closer to rare than medium rare, but I was okay with that. 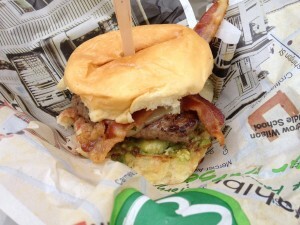 The meat had good flavor and it’s hard to go wrong with bacon, cheese and avocado. The thing that bothered me is that my bun was clearly buttered and toasted, but it was stone cold. How far in advance do they prepare the buns? 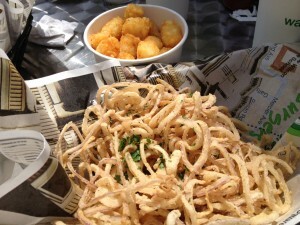 The sides were all good, especially the onion rings, which were thinly sliced red onion. I’ve never seen red onions used for rings, but these worked. I piled a handful on top of my burger and it was even better. The tots and fries were crispy and generously salted. Was it as good as my 10pm burger at Holeman & Finch? Not even close, but it was a nice place to grab lunch before a shopping excursion.